Little Choptank Rockfish – Here you go, my latest weekly newsletter – available bi-monthly! Sorry about that, but where does the time go? I’ve been fishing fairly often with some good to outstanding catches to report. We had another of those mornings with BIG stripers crashing topwater plugs, and I really do believe if the wind would cooperate we would see this type action most every morning; but I’ll get to that in a moment. Here is a sample of what has been going on in my neck of the woods. Maurice Klein and his younger brother Paul joined me for an early morning excursion on the Little Choptank river one day last week. We cast Stillwater Smack-it poppers and Storm Chugbugs around shoreline structure with limited early success. I was beginning to get a little nervous, as guides tend to do on half day trips, when the tide turned and brought clean water to the fishing grounds. 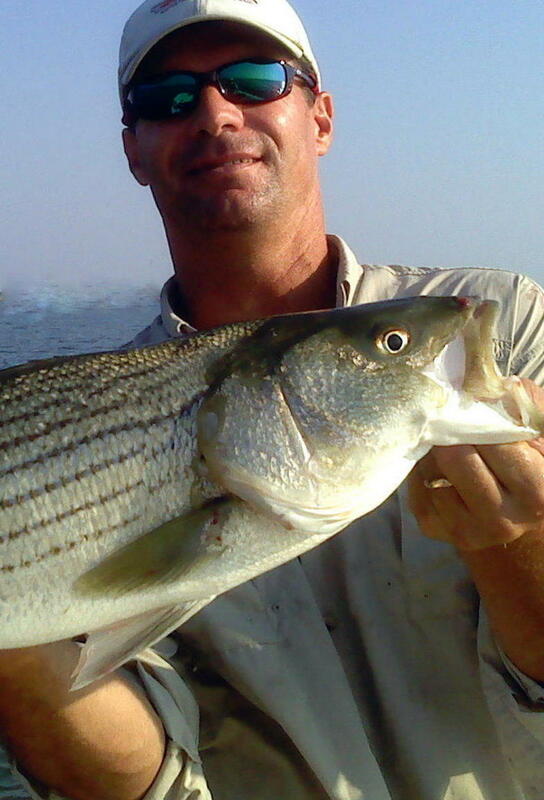 We started to have some decent action with stripers to 23 inches crashing our topwater offerings. It would have been an even better morning had we not lost the three biggest fish of the day. Fish that looked to be upwards of 26 inches exploded on the popper only to immediately find structure and promptly remove themselves from the plug. Such is skinny water structure fishing. We still got to observe the explosive strike and initial run, however brief it may have been. A second trip to the same area with Chris Karwacki Jr. and his wife Heather brought slightly different results. After another slow start (why am I getting up so early) we had some super fly rod action on small school stripers right before noon. While not the big fish we had been anticipating, there is nothing wrong with catching 14″ – 18″ rockfish every cast on an 8 wt. fly rod. 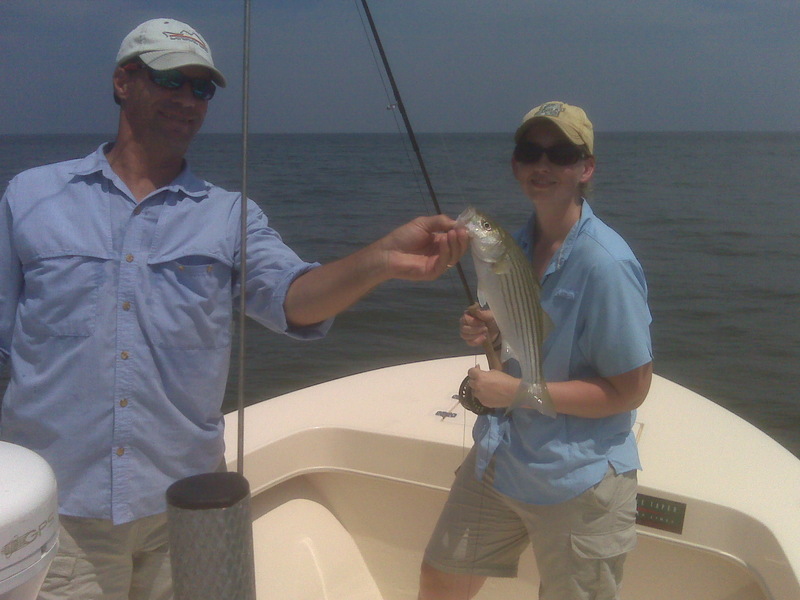 Heather managed her first ever fly caught striped bass, to add to her growing list of fly caught species. Nice job Heather! The thirty or so stripers caught during the last hour made the trip a complete success. Jack McKenna made a trip to Crisfield with me in hopes of snagging a ten pound striper on a fly rod. Well, we got it half right. While Jack had some good action on rock to 23″ on the fly, the guide made the mistake of catching the three biggest fish of the day, all over 30″. The biggest stretched out at 32″ and yanked the boga down to eleven pounds. The big fish were simply exploding on Stillwater and Storm poppers, some even jumping clear of the water, but they would not even look at the fly popper, no matter the size. We tried the pop-n-switch to no avail. I guess the axiom big baits-big fish holds true. To his credit, Jack was content to catch the slightly smaller fish on the fly, and he refused to allow me to keep my line in the boat. All fish were landed in short order and swam away with a healthy kick. July has seen some unbelievable topwater fishing, and it sure is a sight to behold when the bite is on! If you missed the spring flats fishery, come try this while it lasts. Just yesterday I had a trip to the same area out of Crisfield but the forecast 5 – 10 mph winds were blowing at a steady 15 – 20. The water was a mess when we arrived and my three fishermen, Dennis Smith, Gary Burnett and his son Jeremy were quite content catching smaller stripers in the two to three pound range. A common key for the topwater bite has been finding clear water – it’s an absolute must. We spent the remainder of the day casting to 2 – 4 pound bluefish, most of which provided us with great head-shaking aerial displays. Super fun on light spinning tackle. All-in-all a great two weeks!